We’ve just stocked up on a whole range of the latest equipment and performance apparel from Bad Boy. 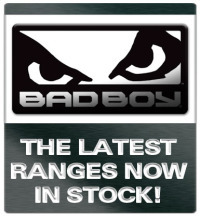 Bad Boy have always offered great quality at affordable prices and their latest ranges are no exception. Check out the list below to view each of the new products individually, or go to theAi? ?Bad Boy – What’s NewAi? ?page on our site. This entry was posted in News and tagged Badboy, MMA on 25.09.2013 by .